The third and fourth issues of Crimespree Magazine are bundled together for the first time as an eBook for all you collectors. 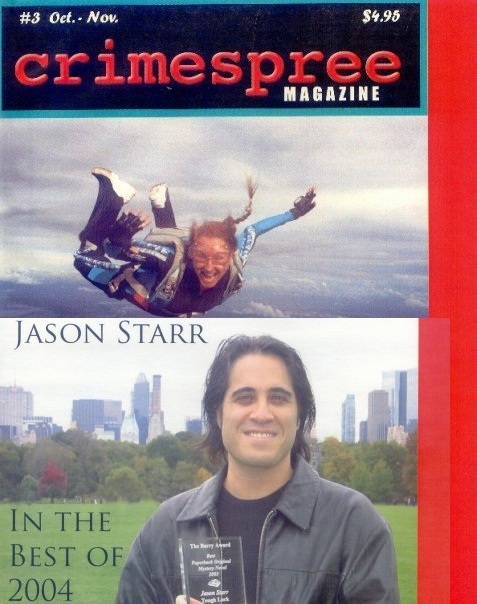 These issues featured an article from Vicki Hendricks about skydiving and a best of 2004. These issues were originally published in Oct-04/Nov-04 and Dec-04/Jan-05. Issue 3 included an interview of Ken Bruen by Jason Starr, the secret of Father Brown by Ruth Jordan, brunch with Rick Riordan, S.J. Rozan’s love of basketball and Jon Jordan’s Max Allan Collins interview. Additionally there’s Bouchercon 2004 coverage. B-Con articles about Man of the Year Peter Robinson, American Guest Jeremiah Healy, British Guest Lindsey Darb and Lifetime Achievement Award winner Bernard Cornwell. Max Allan Collins writes about Gary Niebuhr, Aldo Calcagno writes about blogs while Scott Phillips discusses his summer vacation. Issue 4 includes Sarah Weinman’s appreciation of Ross Thomas, Barry Eisler’s character, John Rain, provides personal safety tips and Tom Waits and Noir are explored by Ray Banks. David Corbett discusses Noir, Jen Jordan talks with Charlaine Harris about Sookie and James O. Born explains why he hates James Hall. Short stories are supplied by Michael A. Black, Zane Radcliffe, Sarah Weinman, Steve Torres, Rick Mofina and Brother Jon Jordan. Regular contributors include Donna Moore, Jim Pascoe, Reed Farrel Colemen, Ayo Onatade, Ali Karim and Sarah Weinmann. You can find the Kindle edition here and the Nook version here.